Google has created the best operating systems with most delicious names. 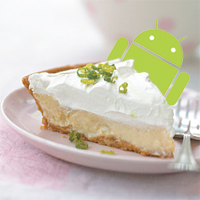 This tradition is set to continue with the current version called Ice Cream Sandwich OS, the next one called Jelly Bean OS and the one after that to be called, wait for it…. Key Lime Pie! While even the Jelly Bean OS will make its debut only by fall this year, talks about the following version have started. But, how are we sure that this just might be it? Well, start thing about dessert names starting with K since Google has had names of its operating systems in alphabetical order, not much comes to mind, does it? Secondly, this info has been leaked by the folks at the Verge, the same people who outed the Jelly Bean last year, which was confirmed at the MWC. Had they asked us, we could have suggested something like Karachi ka Halwa, but then they need something to ring a bell in the U.S. and the U.K, don’t they?